Sucker Punch Productions' anti-hero action game inFamous looks to deliver the sort of everyman superhero found in Hancock, just without all that alcohol and attitude. The game, due out next year on the Playstation 3, starts off with an explosion tearing through Empire City, killing everyone in a six square block, everyone but Cole. As he recovers from the blast the city starts to fall apart with people rioting, then a plague strike and finally all of Empire City is quarantined from the mainland. A television broadcast links Cole to the scene of the bomb blast and he becomes a wanted man, but he also recovers to find himself with super electrical abilities. 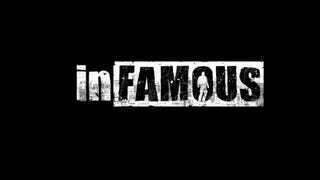 inFamous has players battling through the now crime-infested city working to solve the mystery behind the blast while also learning Cole's new super powers. Sucker Punch's Brian Flemming told us that before the blast Cole was an urban explorer, a guy who liked to climb around and explore the city. So there's a taste of parkour. "This is a modern super hero story," Flemming said. "It's different from traditional super hero games. We wanted to create a character from the ground up. "Initially you go through this psychological side, 'Am I going crazy? Can I really control electricity?'" While all of Cole's powers are meant to be based on the control of electricity, the developers got pretty creative with them. You can lock someone to the ground with bands of electricity around their ankles and wrists. You can heal people. You can kill people. A huge element of inFamous is Cole making moral decisions about whether he wants to be famous as a super hero or infamous as a super villain. They declined to tell us how those decision would play out in the story, but one would assume it would change things. The did tell us that your powers grow as you make those moral choices. The team pushed heavily on making the game feel more organic, specifically in the way people react to you and your choices. In other words, they want you to feel the love or hate of those trapped in the city with you. The Sucker Punch folks told us that some of their inspirations for the game came from some real world events that happened in Seattle in the past years. One was the six days the city was without power and how that changed the way people had to live their lives for the week. The other was one of the developer's experiences participating in the 1999 WTO protests in Seattle that ended in pepper spray and riots. "In the absence of law," Flemming said he discovered, "there is a new morality."